The Wisconsin Department of Revenue reports on beer production in Wisconsin are now complete for the first six months of 2016. Hiding in the stream of numbers is an interesting story developing in Oshkosh. I’ll get to that, but first let’s get to the raw data. This is the amount of beer produced in Oshkosh through June of this year. The figures are reported in barrels (a barrel of beer is 31 U.S. Gallons, or about 13.75 cases). Let’s get behind those numbers. We'll start with Fox River Brewing. The production records that were set last year at Fox River are in the process of being obliterated this year. Production at the Oshkosh brewery is up just over 26% in comparison to the same period last year. That’s just part of the Fox River story. At Fox River’s Appleton facility, where the brewery operates a bottling line, production has increased over 50% when compared to the first six months of 2015. The trend appears even more extreme when you look at Fox River’s growth over the past four years. Production this year is up 133% in comparison to the first six month of 2013. At this point Fox River Brewing has to be among the fastest growing breweries in the state. That could become a problem. At the end of last year, Fox River was nearing capacity at its two facilities. It’s difficult to see how they’ll be able to sustain this level of growth without expanding their production capabilities in some substantial way. It’s going to be an interesting second half of the year. Now over to Bare Bones: The brewery didn’t begin producing beer until July 2016. That leaves us without a month-to-month comparison for the first half of the year. So, we’re left looking at average monthly output. And in this case that’s not a good comparison point. Most breweries, tend to produce less beer during the first half of the year than they do in the second half. With that in mind, there’s good news coming out of Bare Bones. Average monthly production last year was just under 22 bbls. Through the first six months of this year it’s just over 26 bbls. That’s a trend that bodes well for the brewery. Lion’s Tail Brewing, Neenah: 103.57 bbls. Lion’s tail didn’t begin showing up in the state reports until this past April. Its first beers were produced at the Appleton Beer Factory. Now that production has been brought in-house, the second half of the year will tell us much more. From what I’ve seen, it looks as though things are going quite well there. Knuth Brewing, Ripon: 40 bbls. Knuth began reporting production in January 2016. The brewery just installed a new, larger brew system, so we’re bound to see increased production coming out of Ripon. Appleton Beer Factory: 146.25 bbls. That’s down about 10% over the same period last year. Stone Arch/Stone Cellar, Appleton: 1379.57 bbls. That up almost 9% over the first six months of last year. Rowland’s Calumet Brewing, Chilton: 110 bbls. An increase of 13% over last year’s first six months. 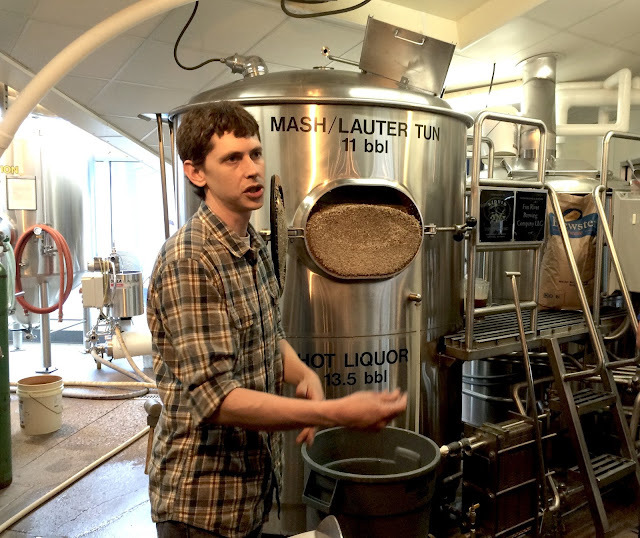 Overall, we’re seeing encouraging signs for brewing in this part of the state. Good news for all of us who like to drink locally made beer. It wasn’t to be. The hops market gradually collapsed in the 1870s. The county’s hop culture began winding down. By the end of the 1880s, all of it was gone. With it went the memory of what had been so vital. Most of those who made it so were forgotten. We have a few of their names. There was Silas Allen in Allenville. Luke LaBorde in deserted Delhi. And John Braley in Oshkosh. Another name to add to that list is Lorenzo Hinman. His hop farm in the Town of Clayton was said to be among the largest in the county. Hinman was a Yankee, born on January 4, 1823 in West Stockbridge, Massachusetts. He was a direct descendent of Sgt. Edward Hinman, an English puritan who migrated to the Massachusetts Bay Colony in 1650. For nearly 200 years, Massachusetts was where the Hinmans remained. But Lorenzo Hinman went wandering. Hinman first went to New York. Then pulled by the lure of abundant and cheap land, he headed west. He may have been among the Hinman clan that in 1845 travelled from New York to Chicago by sailing ship then journeyed north by ox team to Wisconsin. 1846 saw Lorenzo Hinman settled in Walworth County. A couple years later, he was back on the move. 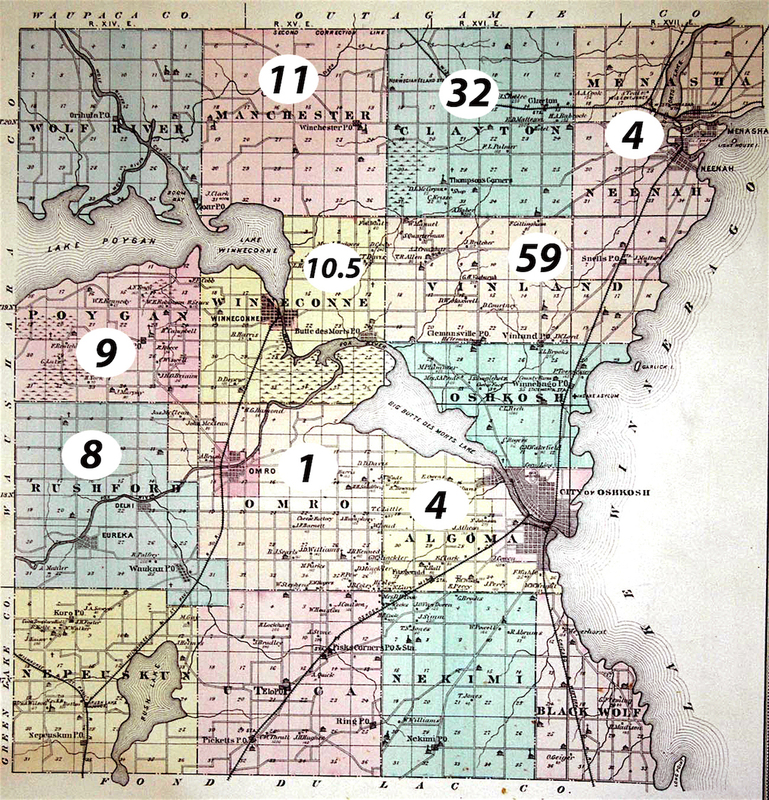 On September 1, 1848 at the federal land office in Green Bay, Hinman purchased 360 acres in Winnebago County. The deeds Hinman received were signed by the 11th President of the United States, James Polk. The largest contiguous piece spanned the townships of Clayton and Vinland. The 320 acre parcel is bisected by the current Breezewood Lane. It’s bordered on the east by Center Road. 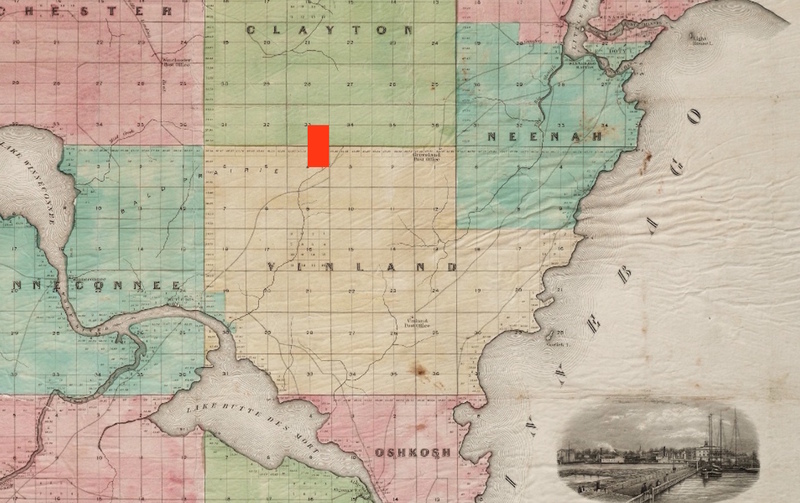 Here’s an 1855 map of Winnebago County with the Hinman property blocked in red (click the image to enlarge it). Hinman sold the Vinland portion to his father. He kept the SE ¼ of Section 33 in the Town of Clayton for himself. This is where he would stay. He cleared the land, built a home and established a farm. Here’s a recent satellite view of the area with Hinman’s property framed in yellow. We're looking at the northwest corner of Breezewood Lane and Center Roads . Hinman was among the first settlers to what officially became the Town of Clayton in 1849. It’s unlikely he arrived there with thoughts of hop growing in mind. 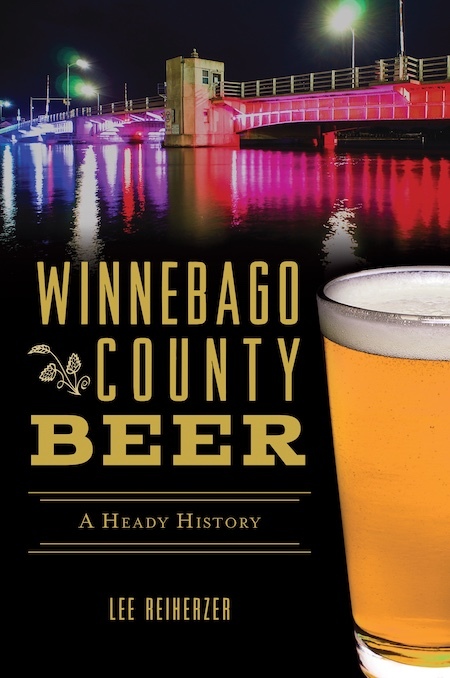 There is some indication of hop culture in the northern part of Winnebago County in the late 1840s, but it appears the plant's spread into the Town of Clayton came later. The 1850 Wisconsin Federal Census doesn’t enumerate hop production among the township’s agricultural output. A less formal survey of agriculture in Clayton made by the Oshkosh Democrat in 1851 also makes no mention of hops. But by the mid-1850s, hops had arrived. Perhaps inspired by the success of hop culture in bordering Vinland, Hinman and other farmers in Clayton began putting down rootstock. The 1999 book The History of the Town of Clayton suggests that hops had taken hold in the township by 1856. That date corresponds with the initial spread of hops in Winnebago County. It’s not known when Hinman’s yard began bearing hop cones, but the crop obviously served him well. At least in the beginning. By 1860, Hinman had begun his rise. The 37-year-old listed his net worth as $4,430.00 or about $130,000.00 in today’s money. It was just the start. Hinman, like other farmers in the area, was swept upward by the momentum of rising hop prices. 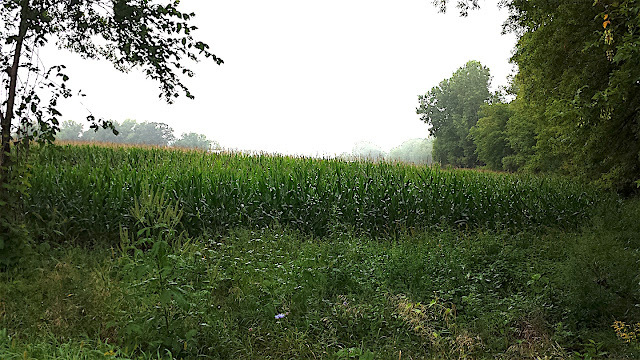 How much of his land he devoted to the lucrative crop is another unknown. The History of the Town of Clayton states that Hinman had in excess of 300 acres devoted to hop production. That would have been impossible. During Hinman’s time, hops were picked by hand. It would have taken more than 2,000 people a month to harvest a crop of that size. There’s just no way. More likely, Hinman’s yard comprised 10-20 acres. Even a yard of that acreage would have required nearly 100 pickers or more for the August/September harvest. Meanwhile, Hinman amassed wealth. Over the course of the 1860s – boom years for hop growers – Hinman did well. He bought more land. In 1870 he posted a net worth of $21,550, or about $404,000.00 in today’s money. He was at his financial peak. But the good times were just about over. As the price of hops plummeted in the 1870s, hop farming in Winnebago County dried up. Many of those who had vested heavily in the crop lost their farms. Hinman didn’t. But he doesn't appear to have come out unscathed. 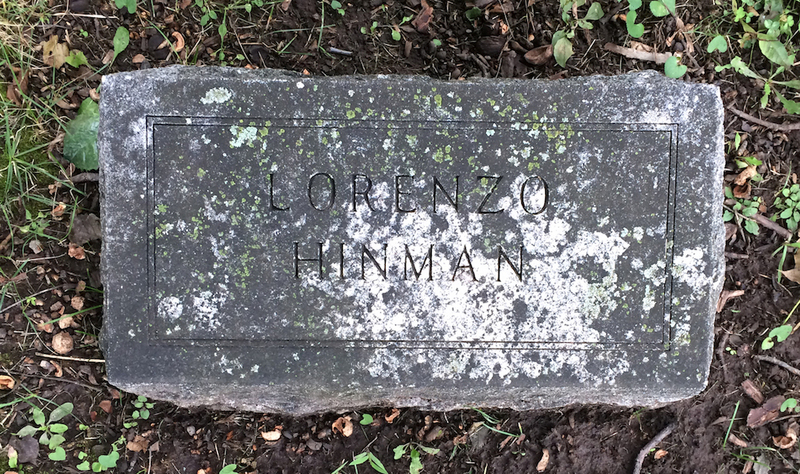 When Lorenzo Hinman died on September 16, 1896, he still had his farm. But much of his wealth had been erased. While he owned more than 320 acres of land, he had less than $700 to his name. Hinman died land rich and cash poor. 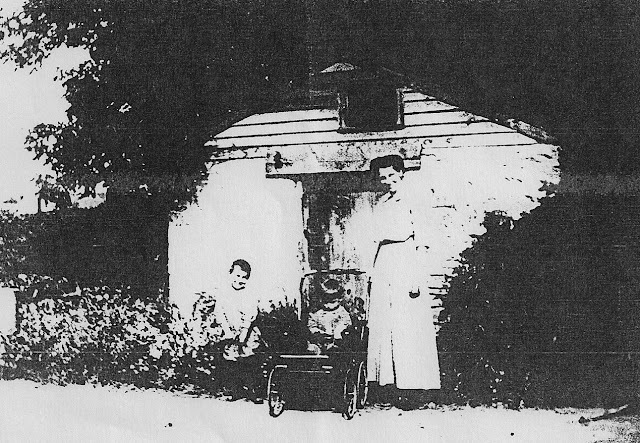 The Hinman land in the Town of Clayton remained with the Hinman family until the end of the 1940s; a century after Lorenzo Hinman arrived here. One of the few remnants of his hop yard were the old hop poles stacked by an outbuilding near the house. Hinman had saved them. They were still there in 1933. I’ve been out to see what used to be Hinman’s farm. I was hoping to find wild hops growing. Some feral legacy of Hinman from the land he poured his life into. A progeny of one that endured the uprooting after everything went to hell. So far, there's been none of that to be found. 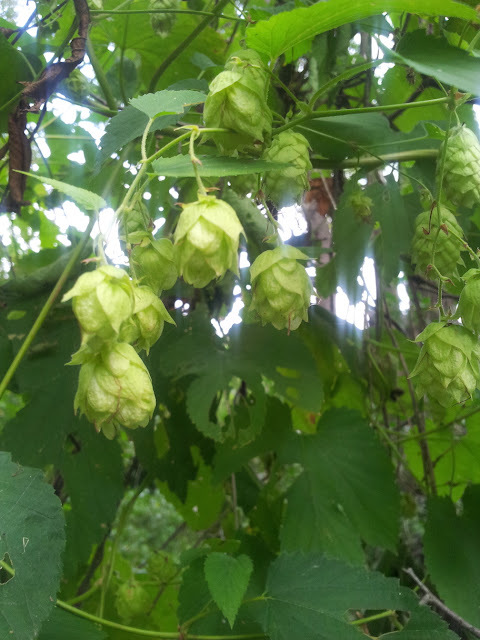 There's more on the Hinman hop farm here. Oshkosh Beer Show #57 – ​Fresh IPA! This time Adam and I are drinking an IPA that’s 60-days old while discussing the ins and outs of fresh beer. The evolution of the American IPA has resulted in an obsession with freshness. We explore how this aspect of beer culture has developed. A short video with Richard Cardenas and RJ Nordlund. They talk about Cordobabock, the beer they collaborated on at Bare Bones Brewery. Cordobabock is on tap now at the Bare Bones Taproom. Late summer always makes me wonder what it must have been like to travel through Winnebago County in the 1870s. In those years, hops were still a cash crop here. As the month of August waned you’d have come across farm after farm with densely thatched hops fields about to be harvested. Hop farming began early in Winnebago County. By the late 1840s, Yankee settlers to the area were already putting in hop fields. The boom years were the 1860s. But hop prices fell after the tremendous harvests in the latter half of that decade. 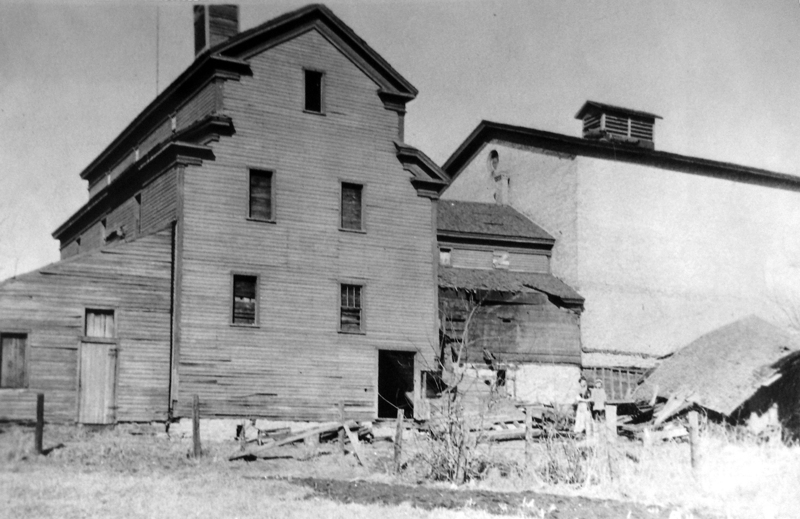 The glut forced farmers here to eventually abandon hops for more lucrative crops such as wheat. 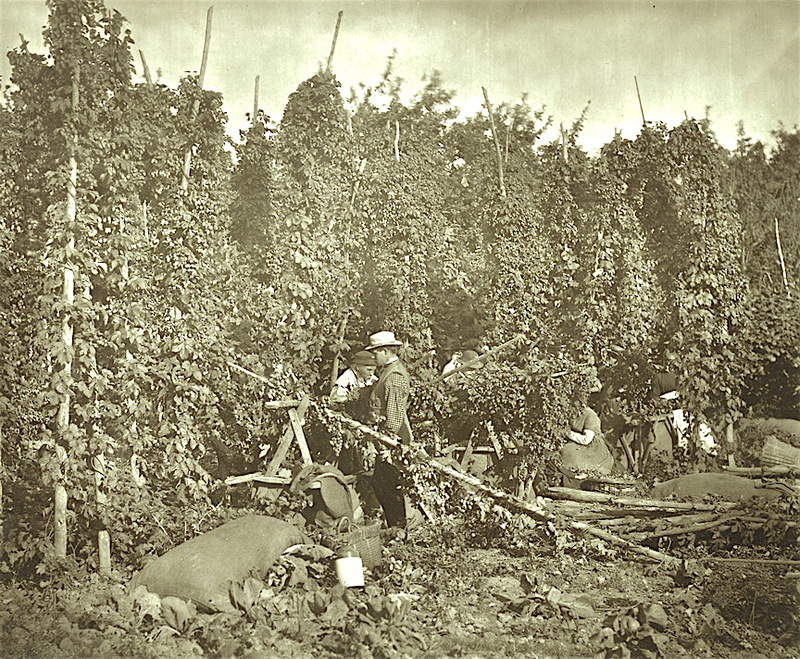 Here’s a snapshot of hop farming in Winnebago County, just as hop production here was ebbing. This is the total reported acreage of Winnebago farm land given over to hop cultivation in 1876. The map shows it broken down by township (don’t be thrown off by Manchester, it’s a misprint; that should actually read Winchester). For a grand total of 138.5 acres. That’s down 12 acres from 1875. The decline would gather momentum. By 1880, hop production in the county was reduced to just 33 acres. 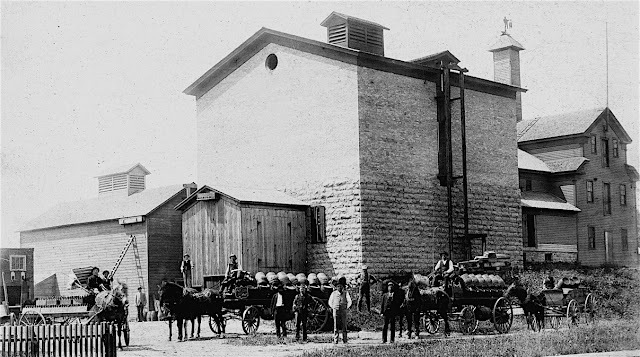 And with the close of the 1880s, commercial hop farming in Winnebago County came to an end. Few remnants of our old hop culture survive. The most tangible link are the hops growing wild on what used to be the hop farm of Silas Allen in Allenville. You can see them if you walk up the WIOUWASH Trail just north of County Road G. Keep your eyes trained on the woods that border the east edge of the trail there. Growing among the trees are vining hops. This time of year you'll see the grape-like cones they produce each summer. Commercial hop farming has yet to be revived here. In the meantime, there are plenty of us keeping the spirit of Winnebago’s hop culture alive. Gardeners in every part of the county grow hops for their own use. The most elaborate setup is Tim Pfeister’s. You can follow Tim’s progress on his Pfeister Pfarm Facebook page. Bare Bones Brewery has gotten into the act, too. 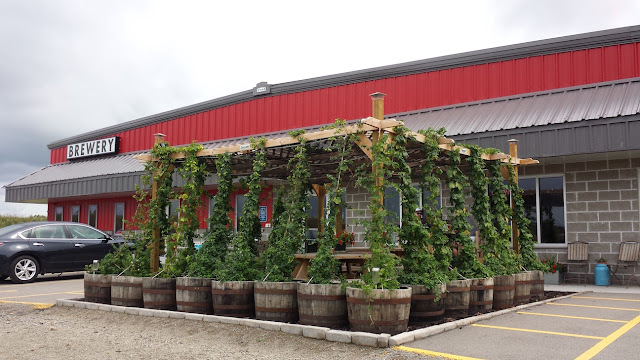 The brewery has hops growing over the pergola in the beer garden just outside its room. I also grow them. This year’s crop is taking a bit longer than usual to develop, but they’re coming along. Here’s a picture of my plants taken Saturday morning after the rain storm. In the middle of that mass are hops I transplanted from the old Silas Allen plot. Not surprisingly, that plant is the hardiest of the bunch. It’s pumping out the cones this year. If Silas Allen were alive to see my urban hop yard, he’d probably scoff. At least until he got up close. I’m sure those pungent cones would bring a smile to his face. Maybe he'd even recognize their genesis. For more on the history of hop farming in Winnebago County, visit the pages here, here, here & here. This week, we're slugging down beer from Lagunitas Brewing. We yap about the brewery and give the once over to Lagunitas Stoopid Wit. 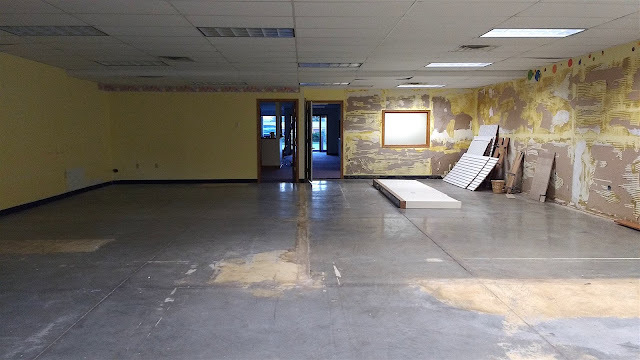 I mentioned last week on Facebook, that the Cellar Brew Shop will relocate to Oshkosh. Doors to the homebrew supply shop will open here on Tuesday, August 30 at 1921 S. Washburn. Here's a look at the outside of the place. 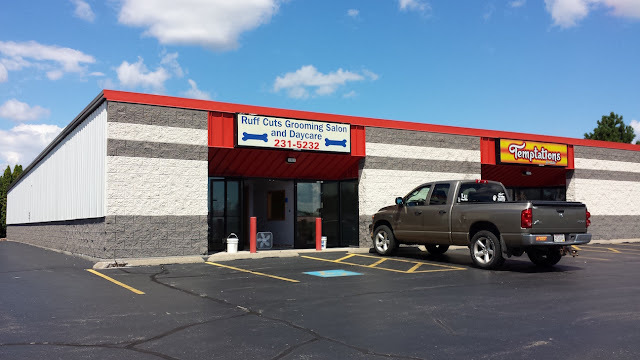 The Cellar will go into the space formerly occupied by Ruff Cuts. A bit of background: The Cellar is currently located on S. Main St. in Fond du Lac. It's been in business there since 2009. This is a full-scale homebrew shop selling everything for brewing and packaging beer. The store also offers a full-line of winemaking supplies. The owner is Dave Koepke. He’s been in the homebrew supply business since 1997. For more backstory, go here. The Cellar’s last day in Fond du Lac will be August 27. Koepke says if you’re looking for bargains on brew supply’s you’ll want to visit The Cellar that day. When the Oshkosh store opens on August 30, Koepke anticipates that he’ll still be working to get things organized. “The doors will be open, but it’s going to look like a construction zone,” he said. 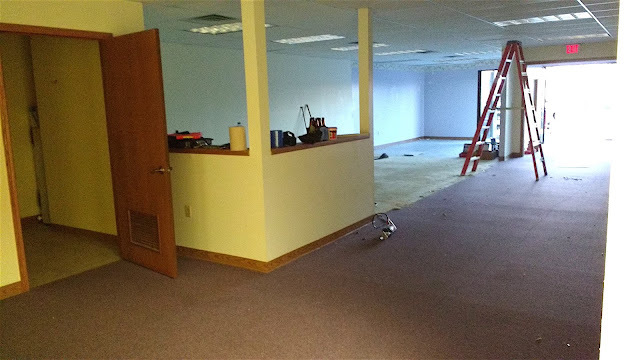 The new space is 3,200 square feet. Large enough for the brewing demonstrations and classes Koepke plans to offer. The easy access provided by its location just off Highway 41 will likely make The Cellar the hub for homebrewing activity in this region. Here’s a look at the interior, currently being remodeled. This should provide a tremendous boost to the Oshkosh homebrew scene. Considering how many homebrewers there are in this city, it’s surprising we haven’t had a store like this before. I’m looking forward to finally having a local homebrew shop. Checkout The Cellar's new store opening event page on Facebook. After last week’s depressing post about the demise of the Gambrinus Brewery it occurred to me that, symbolically at least, the flag of that old brewery is still flying. To explain, I’ll need to start by showing you a picture. Here’s the Gambrinus Brewery, circa 1893. 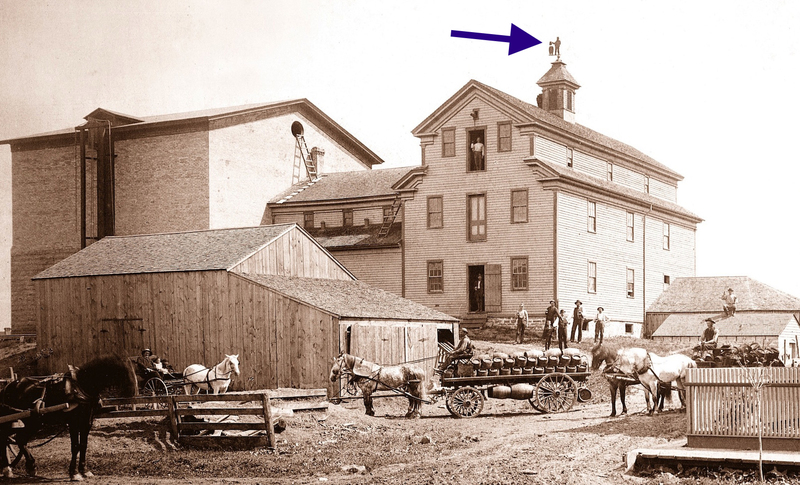 Look towards the tip of the arrow atop the brewery’s cupola. Let’s zoom in on that…. What we’re looking at is a large weathervane that spun with the wind blowing over the Gambrinus Brewery. It depicts King Gambrinus, patron saint of brewers. Gambrinus is holding a stein. He’s standing next to a beer barrel. 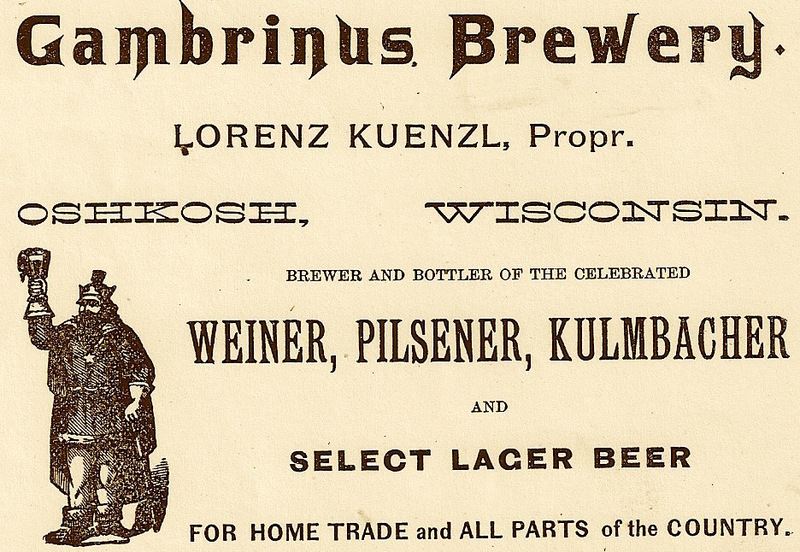 For a brewery named Gambrinus, it was only natural that King Gambrinus would become its favored symbol. The image was used frequently in the brewery’s advertising. Here’s an example. This is a close-up of a corner sign that hung outside the Adolph Baier tavern at the northwest corner of Ohio Street and 7th Ave. The image is a bit hazy, but that’s Gambrinus in the middle with a mug of beer held aloft. The image quality is going to improve as we move along, I promise. Let’s get back to the story of that weathervane…. When the Gambrinus Brewery was taken down, the Kuenzl family saved the symbolic figure that hovered over their brewery all those years. It wound up in the hands of Lorenz Kuenzl’s grandson. He was also named Lorenz Kuenzl. His nickname was Shorty. Here's a photo of Shorty Kuenzl, circa 1960. 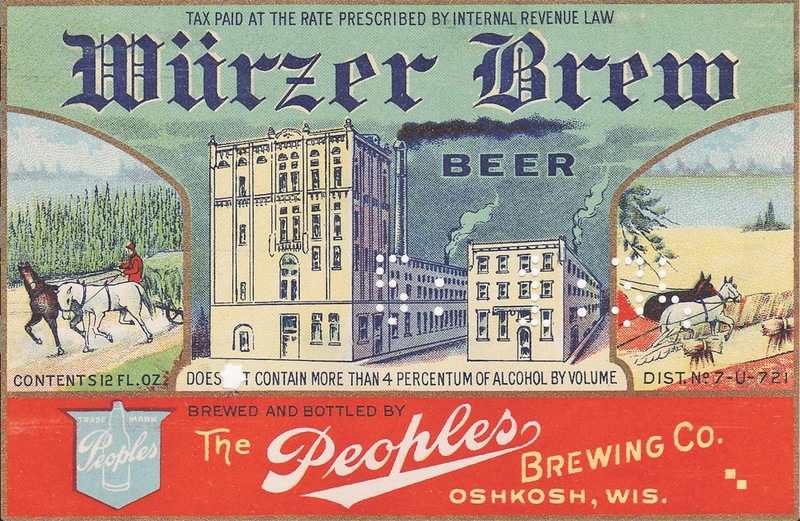 Shorty Kuenzl had a long and interesting beer career in Oshkosh, most of it with the Oshkosh Brewing Company. 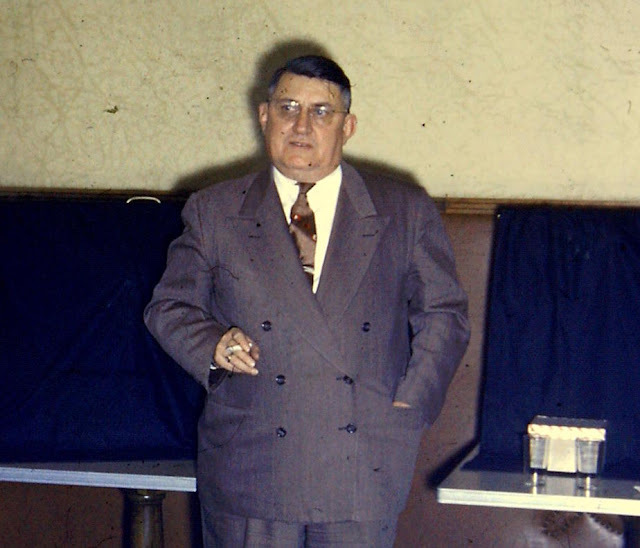 Kuenzl retired from OBC in 1963. He then went on to play a major role in Lee Beverage, an Oshkosh-based beer distributorship. 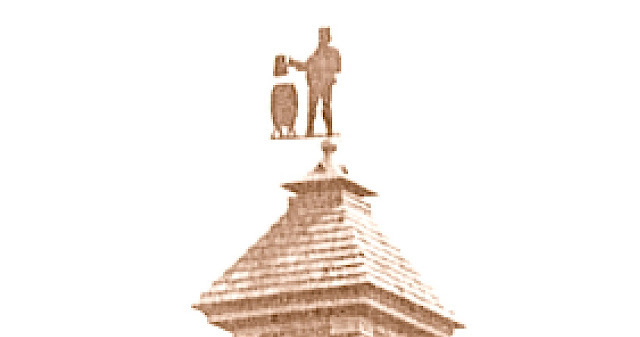 When Kuenzl went to Lee Beverage, the King Gambrinus weathervane came with him. And that’s where it is today. Let’s finally get a good, up-close look at this thing. Considering its age, the piece has held up magnificently. It’s at least 125 years old and spent much of its time being battered by the elements. At Lee Beverage, it was resting in storage for years, but now it’s out again. It’s mounted atop a wooden barrel near the entrance to the building. I’ve spent a lot of time researching the elder Lorenz Kuenzl and his brewery. Sometimes I think I know the man far better than I really do. But when I think of that weathervane and imagine the hundreds of times Kuenzl looked up to see it there above his brewery, I realize he’s still an utter mystery to me. He always will be. 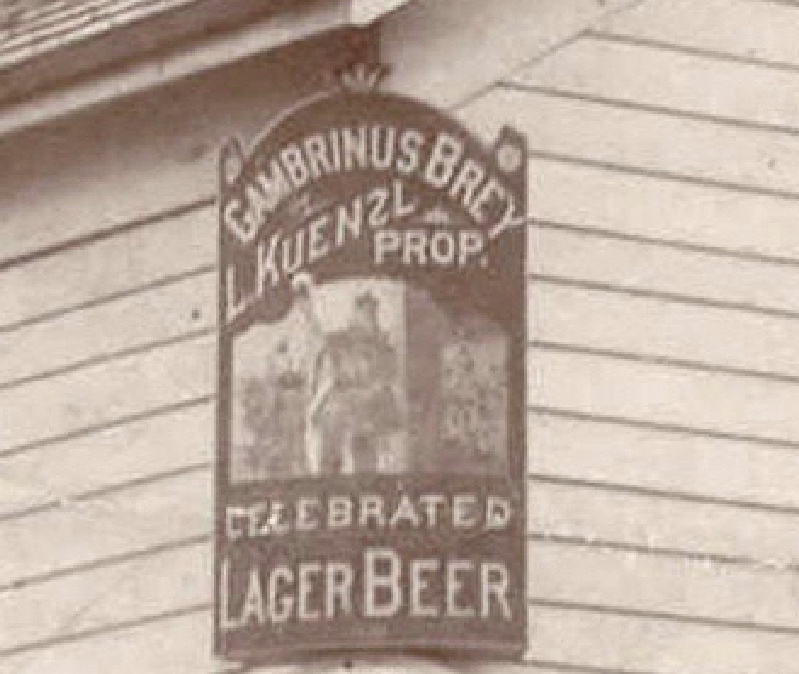 For an in-depth history of the Gambrinus Brewery, go here. After a month off, we're back and talking New Glarus Brewing. This time, we're drinking the brewery’s latest Thumbprint Series release, Smoke on the Porter. The longest running beer festival in Oshkosh is no more. For the first time in 20 years, there will be no Brews n’ Blues Festival this summer. It’s all over. Brews n’ Blues was Oshkosh’s first, annual beer festival. It had a typically Oshkosh sort of beginning: it was dreamed up on a Sunday night in summer at the old Lizard Lounge. The plan was hatched by Janek Cieszynski, of the Oshkosh Jaycees, and Jeff Fulbright, who was looking for a way to promote his struggling Mid-Coast Brewing Company. More than a year later, the event took place. The first Brews n’ Blues was held on July 21, 1996. By the standard of today’s beer festivals, it was a simple affair. It was more like a party, actually. The Jaycees set up a tent in Riverside Park, hired a couple of blues bands and served that new “Microbrewed” beer people had been talking about. Simple. And it worked. More than 600 people attended that first festival. Tickets went for $15 in advance and $18 at the door. The big gate galvanized Cieszynski and the Jaycees. Brews n’ Blues became an annual event. And though the fest would develop, the basic premise it was founded upon remained intact. Which became part of the problem. The expectations of beer drinkers has increased dramatically since that first Brews n’ Blues in ‘96. But the festival failed to evolve along with its patrons. When Brews n’ Blues began, good beer was difficult to find in Oshkosh. That, of course, has changed. And for the past several years, the line-up at Brews n’ Blues has been primarily composed of beer readily available here in bars, restaurants and grocery stores. The festival had come to seem redundant. The end became official when the Oshkosh Jaycees voted to dissolve last fall. There was talk of the Society of Oshkosh Brewers taking over the event, but there wasn’t enough interest to make it happen. Despite its shortcomings, I hate to see Brews n’ Blues go. In recent years, I’ve attended the festival more for the sense of prevailing camaraderie than for the beer. But that was enough and I’ll miss it. It just doesn’t seem like summer without it. 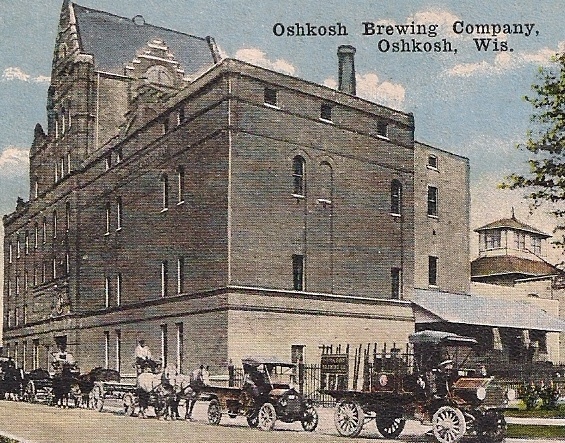 By 1914, the Oshkosh Brewing Company had settled in its imposing, new brewery. It was a modern facility in every way with an enormous capacity of 90,000 barrels annually. The new brewery was more brewery than the company needed. The upgrade created a dilemma: what to do with the three breweries that had been the engine of OBC prior to construction of the new brewery? One of the older breweries was preserved. The Horn & Schwalm brewery near 16th and Doty streets was converted into an office and bottling house. That brewery still stands. The other two didn’t fare as well. The Glatz brewery at the south end of Doty Street was demolished. At least most of it was. Part of the brewery’s stone foundation and beer cellars were left intact. Some of its pieces are still there today. The Gambrinus Brewery on Harney Ave. got the worst of it. It was the smallest of the three breweries that merged to form OBC in 1894. After the merger, the east-side brewery saw only sporadic use; sometimes as a bottling plant, other times as a brewhouse for OBC’s Berliner Weiss beer. But by 1906, the once formidable brewery had been abandoned. It rapidly fell into disrepair. I have a few pictures I want to share of the brewery in its final days. Before I get to those, though, let’s take a look at this brewery in better days. This is what you would have seen, if you were standing in front of what is now 1235-1239 Harney Avenue in 1893. 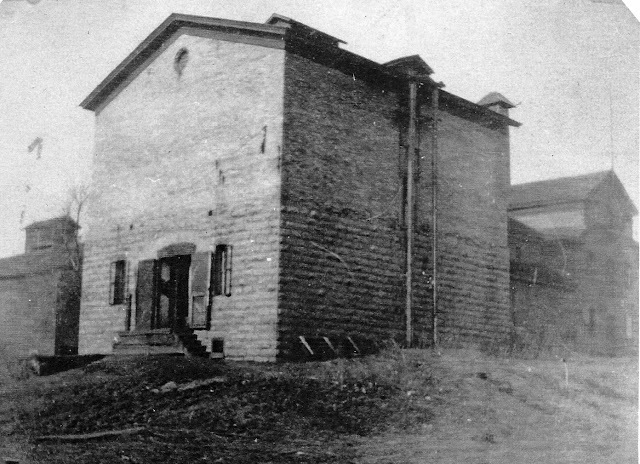 The imposing stone and brick building at the center of the image was the brewery’s ice house. It was approximately 44-feet tall. At the right you can see a frame building with wooden siding. That was the brewery and malt house. By the way, the man in front with white sleeves was the brewery’s owner, Lorenz Kuenzl. The next picture was taken from nearly the same vantage point as the previous shot, but about 17 years later. The brewery had been closed for several years by this time. The next picture is also circa 1910. We’re looking at the brewery’s backside, which faced towards what is now Stevens Park. Just behind the open door would have been the brewery’s mash tun and boil kettle. Here’s the brewery coming down in pieces. This picture was probably taken in 1914. 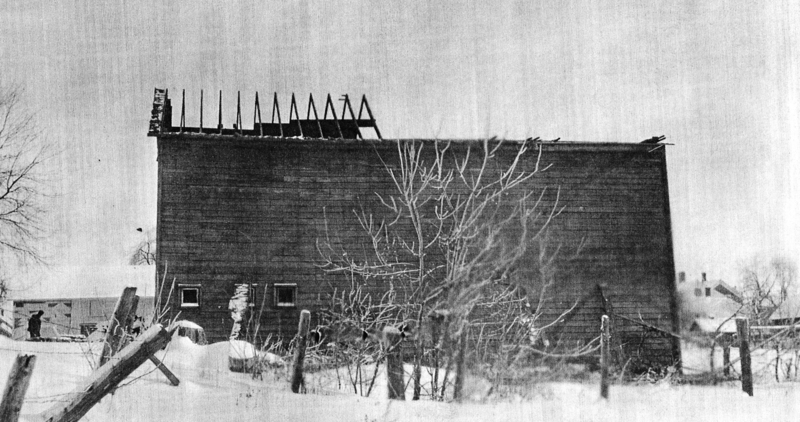 It shows the dismantling of a secondary icehouse used by the brewery. 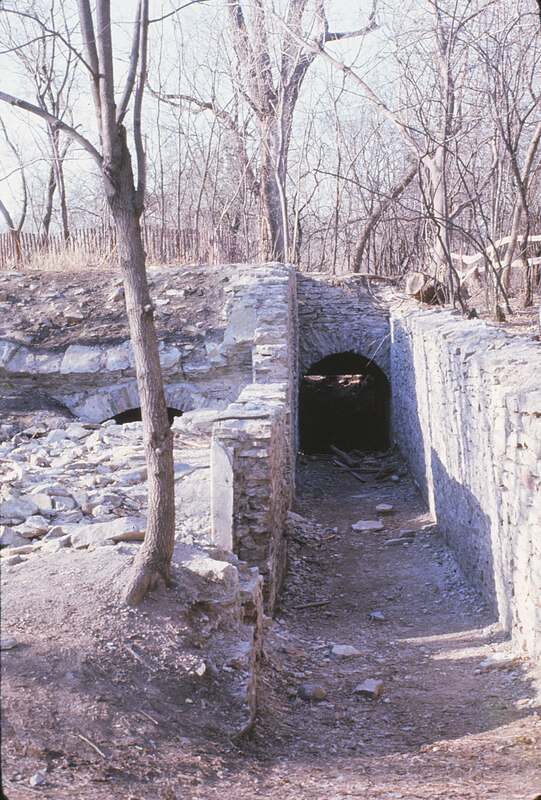 This was located behind the larger, stone and brick icehouse shown previously. The next two pictures are lower quality images, but they’re worth a look. The first of these was taken in 1915. In the picture, you’ll see Mary (Kern) Kuenzl with her sons, Frank and Andrew (in stroller). Mary was the wife of Anton Kuenzl, who was the son of Lorenz Kuenzl, the owner of the Gambrinus Brewery. They’re standing in front of an entrance to a tunnel that led underground to the brewery’s cellars. I’d love to know if those cellars were ever filled in. There could still be beer down there! This last shot is from 1919. The house you see being built in the background is at 1239 Harney Ave. The rubble you see in the foreground is from that massive icehouse, we saw earlier. It took a while to clear that land. It’s all gone now, folks. Here’s an interactive view of the neighborhood as it looks today. I walk that neighborhood frequently. I wish I could have walked it back in the day. In May, Oshkosh Bier & Brewing announced its intention to build a taproom and production facility in Oshkosh. The brewery in planning has now taken the first step toward securing a location. Jeff Fulbright, founder and managing member of OB&B, is seeking a 12-month, option-to-purchase agreement from the Oshkosh Community Development Board. The property he’s after is at the southwest corner of Pearl and Jackson streets. The vacant parcel sits next to the empty Morton’s Pharmacy building. Let’s zero in on that location. The site is highlighted in red. The OB&B proposal is ambitious. 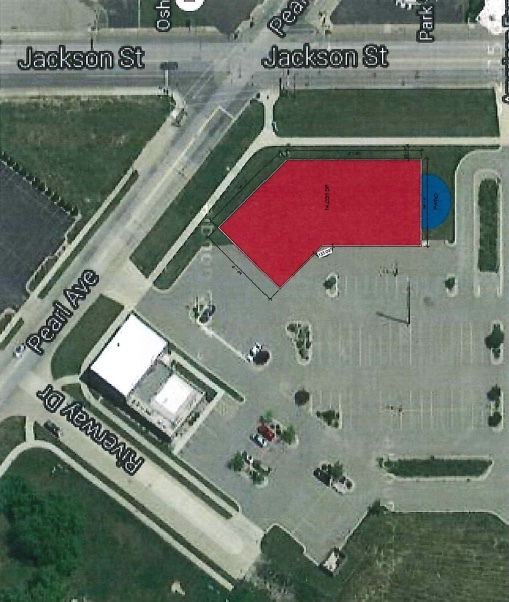 It puts forth a plan to construct the “Largest Oshkosh brewery since Peoples Brewing was built in 1913.” Here are few highlights from the document OB&B submitted to the city. 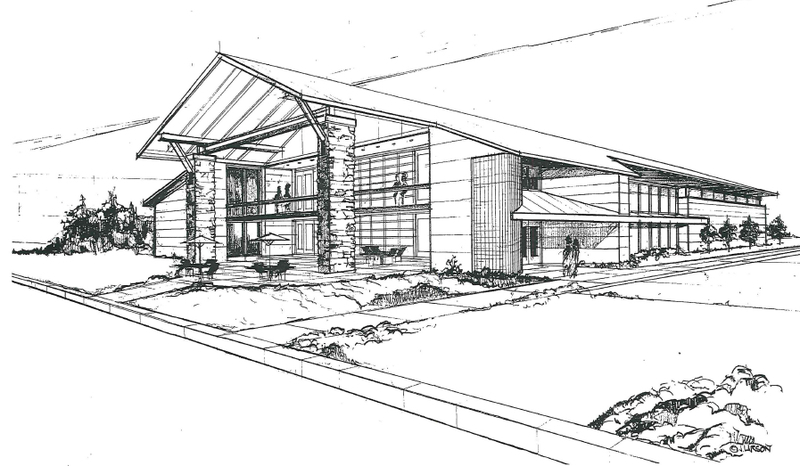 The proposed brewery would be a 15,000 square-foot facility capable of producing 40,000 barrels of beer annually. Included would be a 2,000 square-foot taproom and outdoor beer garden. Estimated start-up cost is approximately $1.5 million. John Zappa, former master brewer from Stevens Point Brewery, will be involved with the launch of brewing operations. OB&B will employ 6-8 people in full-time positions. Distribution of draught and packaged beer will be handled by Lee Beverage. Administrative decisions will include partner and company counsel Charles Hertel of Dempsey Law and an advisory board consisting of partners, investors and local businessmen. The proposal is an interesting document to say the least. You can view it in its entirety here. 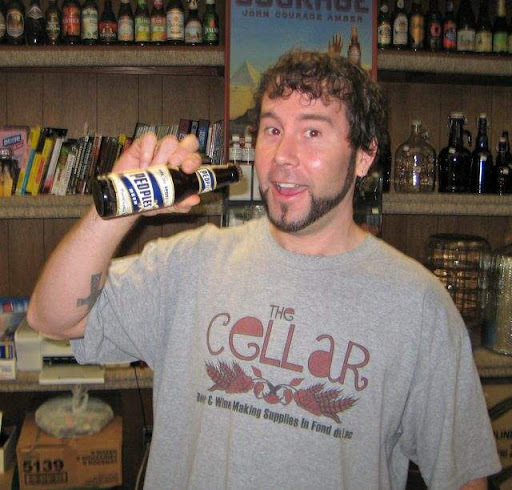 Dave Koepke of The Cellar in Fond du Lac has been talking about moving his homebrew shop to Oshkosh for several months. He’s closing in on making that happen. Koepke has leased a storefront located along the Highway 41 corridor in Oshkosh for his new store. There remain details to work out, but there’s a good chance The Cellar will have relocated to Oshkosh by fall. I’ll have more coming on this in the near future. The Ruby Owl Taproom installed Oshkosh’s first crowler machine last week. The machine packages draft beer in 32-ounce cans for take-away sales. The beauty of the package is that it preserves beer better than the standard growler with screw-on cap. I’ve stored filled crowlers for more than a month before opening. The beer held up wonderfully. We’ll end with a short video of Adam Carlson of the Ruby showing what a crowler fill looks like. Prost! 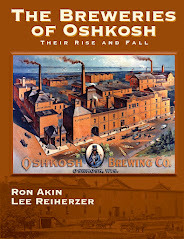 In 1894, Glatz’s Union Brewery merged with two other Oshkosh breweries to form the Oshkosh Brewing Company (OBC). After the merger, much of OBC’s beer was brewed at what had been the Glatz Brewery. That arrangement held until 1911, when OBC built its new brewery on the east side of Doty Street just south of 16th Avenue. Three years after the new brewery had gone up, the old Glatz brewery was taken down. But there are pieces of it that linger. The next time you visit Glatz Park, look for the low, stone wall that runs parallel with Doty Street. It was constructed in either 1867 or 1872 (a note on that below). 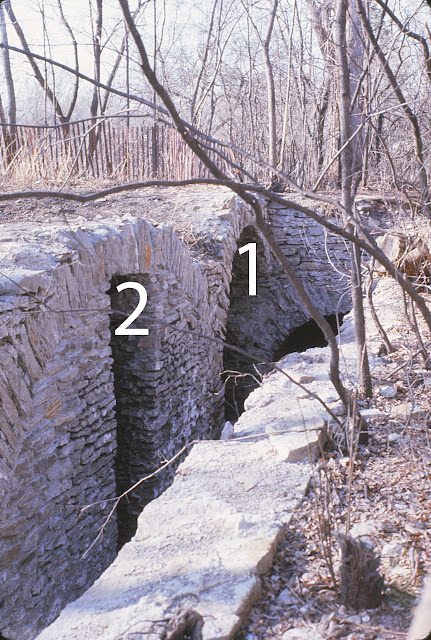 The stone wall at Glatz Park is the oldest piece of brewery standing in Oshkosh. That remaining portion was part of the brewery’s stone foundation. But it was just a small part of the edifice. This was a large structure, approximately 160 feet long and 60 feet wide. The piece that remains was at the back (west) side of the brewery near its southernmost end. Let’s get a sense of where it fit within the rest of the brewery. First, here’s a picture of the John Glatz Union Brewery, circa 1886. This is the front of the brewery. It’s what you would have seen if you were looking west while standing at the southern end of Doty Street. Here’s something to take notice of that we’ll come back to later... Look to the left side of the photo showing the southern end of the brewery. You’ll see an opening leading under the building. That was an access point to one of the brewery’s beer cellars. It looks like the wagons loaded with kegs have just emerged from there. Next is a detail of a Sanborn Fire Insurance Map published in 1903. 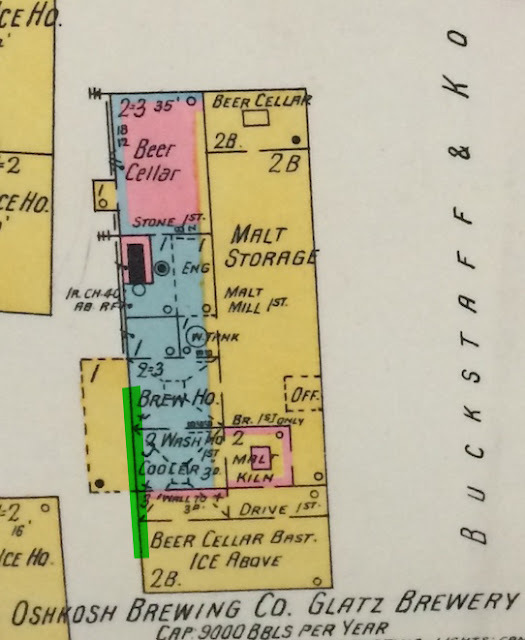 I’ve added a green highlight over the approximate location of the foundation wall that remains in Glatz Park. That remaining piece is about 58 feet long. 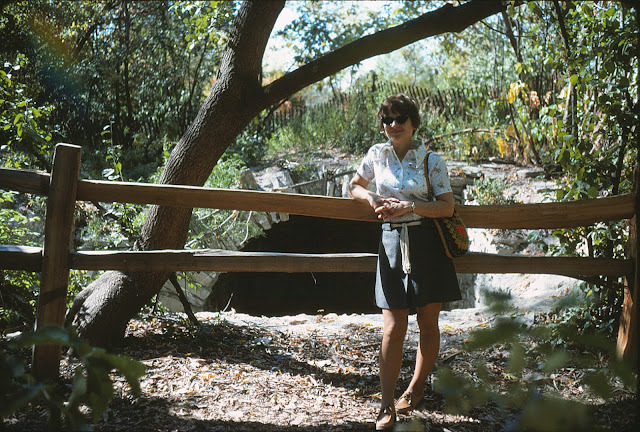 Nearly 100 feet of that wall was still intact when Glatz Park opened on July 4, 1976. If you visit Glatz Park, take a look on the east side of the wall. You’ll find plenty of evidence of the beer cellar that was at the southern end of the brewery. 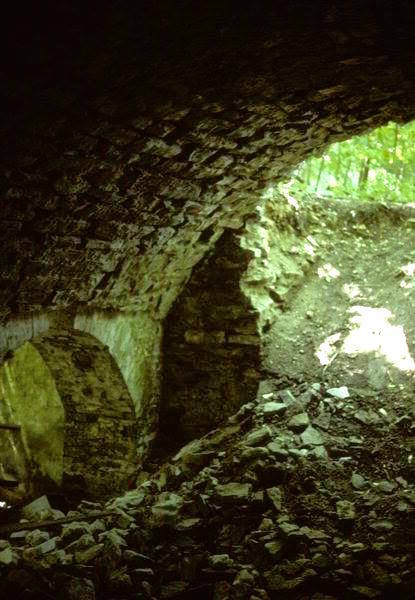 What’s left is rubble, but it wasn’t all that long ago you could prowl the caverns where Glatz lagered his beer. These caverns were once the main attraction at Glatz Park. Let’s take a virtual tour. Entering the park from Doty Street, you’d get your first look into the cellar. For the picture below the camera was aimed north. Beyond the fence, you can see the stone arch above the entrance to Cavern 1. There were two main caverns under this end of the brewery. 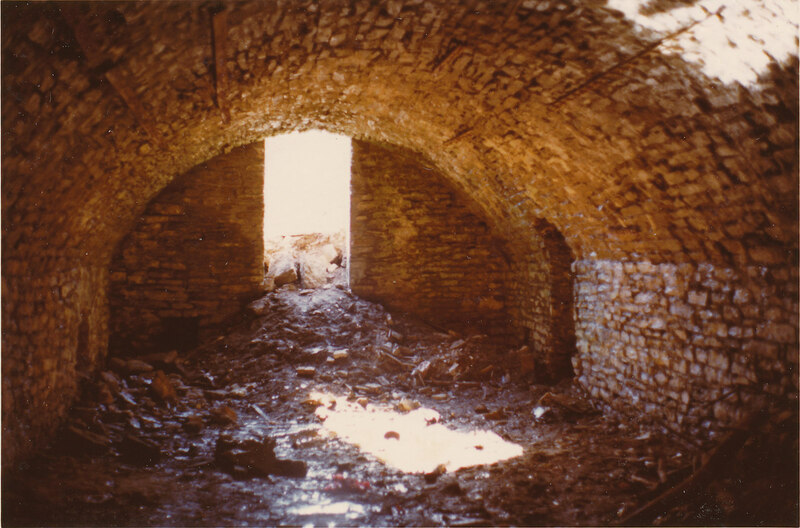 Both were approximately 15 feet wide, 25 feet long and 12 feet high at the peaks of their arched entryways. In the picture below, we’re looking down at the two caverns. Cavern 1, which we saw in the picture above, is to the right (east). Cavern 2 is to the left of Cavern 1. Here’s a walkway that ran along the south end of the two caverns. Straight ahead we see a smaller arched doorway that led out towards the front of the brewery. The wall on the right was the southernmost foundation of the brewery. Now a look inside those two caverns. Here’s the inside of Cavern 1 looking north. And here’s the inside of Cavern 2, also looking north. It kills me that these have been lost. I’ve heard stories that stone from the caverns was taken to the Paine for use in the formal garden that was there. I haven’t been able to confirm that. One last thing: I’d love to hear from people who remember exploring Glatz Park when the beer cellar was still accessible. I’ve been going by old maps and pictures to draw my conclusions. That’s better than nothing, but the potential for error is high. If you know more, or can correct mistaken interpretations I’ve made, please leave a comment or contact me at oshkoshbeer@gmail.com. 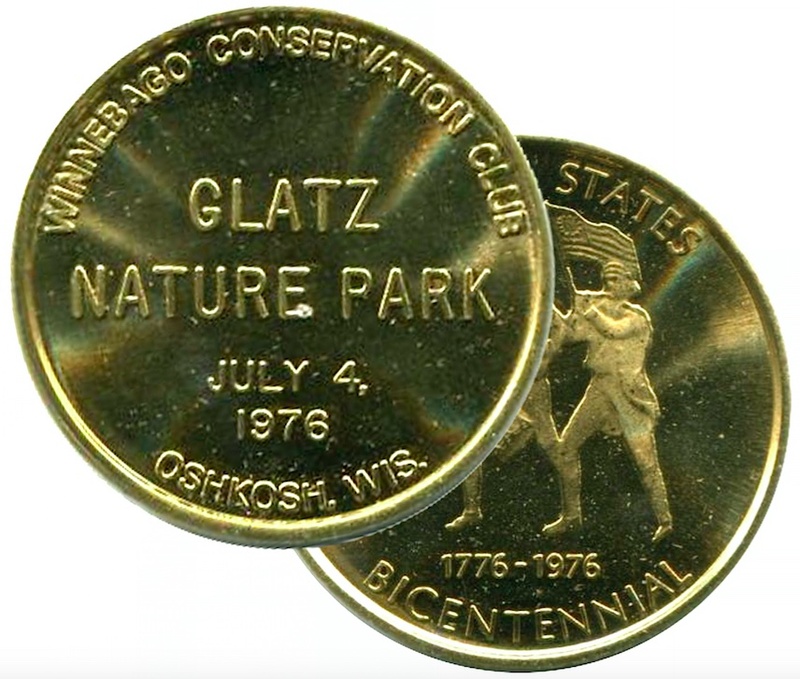 And if you haven’t visited Glatz Park yet, don’t wait too long. As the past attests, what’s left may not last. Thanks to Steve and Janet Wissink for sharing their memories and pictures of Glatz Park. Note on dates: The first brewery at what is now Glatz Park was built in 1867. That brewery burned in 1871. 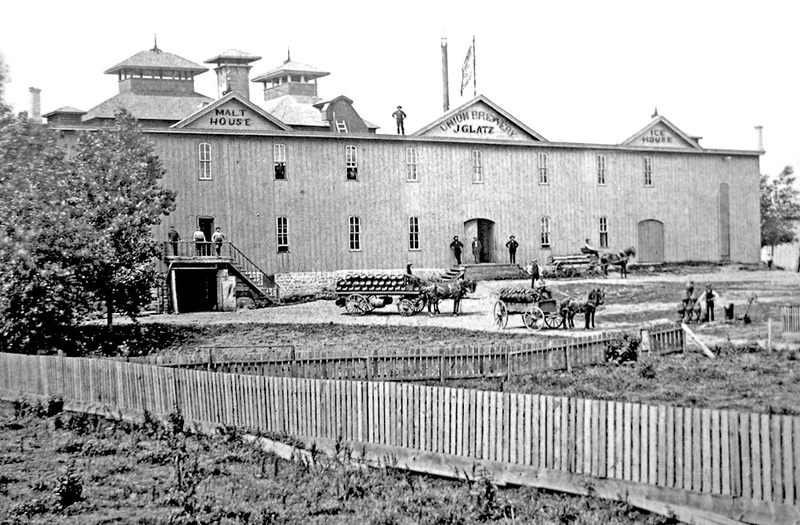 The brewery was rebuilt in 1872. It’s not known if the portion of the foundation still standing was part of the original, 1867 brewery.